Don't think your child is too young to visit a museum. These days, many museums are child-friendly and have hands-on displays for youngsters. Visiting museums of any kind regularly could result in a lifelong enjoyment of various arts. So make it fun, enjoyable and not too long – and offer an ice cream at the end of the day! Many adults credit their fascination with and love of the arts to their parents. They are the first ones who introduce us to certain ideas and events, and it's often thanks to them that our own tastes develop in a specific way. Turning your child on to the arts early and giving them a lifelong appreciation of the art world is something they'll always treasure. Saying that, during their early visits your children will like a museum more if there are things there that hold their interest or capture their imagination. Very young children will relate well to bright colours and bold, modern sculptures, while older kids will appreciate things of particular interest to them (see below). If you love Canaletto, don't expect your two-year-old to want to spend three hours staring at paintings of Venice with you! Something a lot more child-friendly would be more appropriate. Don't forget that your child will also need to be taught proper museum behaviour. That means no touching, eating, drinking or running, and also means keeping voices down so as not to disturb others. 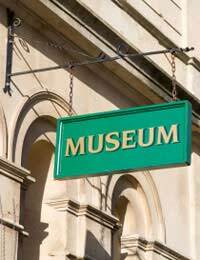 Children's museums, however, may have less strict rules - much better for an active child. Start by taking your child to a science, natural history, or children's museum, with plenty of hands-on activities and exhibits to keep them occupied. Dinosaur exhibits, doll and/or toy museums, mummies and space displays are all popular amongst the younger set. Once they are used to the concept of a museum, take them to an art museum. You know your child best, and can tell whether they will take more quickly to modern art or paintings by the old masters. Some kids will love sculpture, others will prefer bright splashes of colour. While you are there, give them very brief explanations of the art and encourage them to make their own. Take along a sketch pad and coloured pencils, and ask them to copy paintings they like. Don't spend too long at the museum, and make sure you stop in the cafe for a treat, and perhaps buy a gift shop postcard of a painting they really liked. Next time, spend a bit longer. Introducing a child to a museum can be a wonderful introduction to the arts in general. If you appear enthusiastic and eager, they will follow your lead. Look at exhibits together and talk about them openly, letting them know what you like and dislike but allowing them to have their own opinions. Even small children will tell you what they love – and hate.